Sister Emmanuel Shen talks with members of the congregation after Easter weekend services at Church of the Transfiguration on Mott Street. The two-century-old parish was founded by English-speaking German Lutherans in 1801, and saw its congregation change along with the neighborhood’s population, from Protestant Episcopal to finally Roman Catholic, serving Irish and Italian immigrants, whereas mass is delivered in Cantonese, English and Mandarin these days. A lifelong teacher and former school principal, Sister Emmanuel grew up in Shanghai and lived in Hong Kong, Macau and Taiwan, before receiving her religious and professional training in Sydney, Australia. 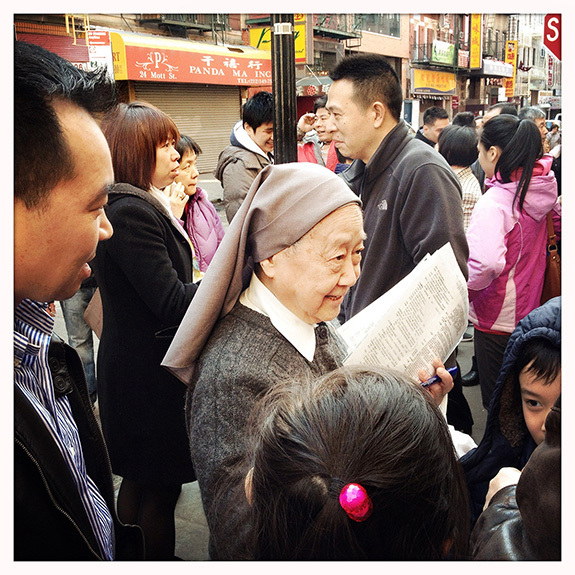 She joined the NYC convent of the Franciscan Missionaries of Mary in 1997 and has been instructing Chinatown's new generations of immigrants in the Rite of Christian Initiation Process. She has provided pre-matrimony counseling to more than 100 young couples of the congregation. “Today’s parishioners are more active, and assume more responsibilities,” and lasting relationships are built with Mandarin-speaking new immigrant families from Fujian Province and the church, while former congregants who have moved to the suburbs return for services held in Cantonese.